39 Residence offers pure luxury and style in the very heart of Bangkok. This modern condominium’s rooms are spacious and stylishly decorated. With eighteen unique units to choose from starting with 80 square metres to an impressive 130 square metres, this is the perfect choice for discerning city slickers. 39 Residence comes complete with a large number of shared facilities that are sure to make staying there extremely comfortable. 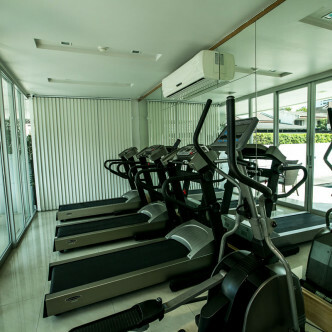 Fitness fanatics will be able to work up a sweat in the onsite gym, which boasts several treadmills and cross trainers. 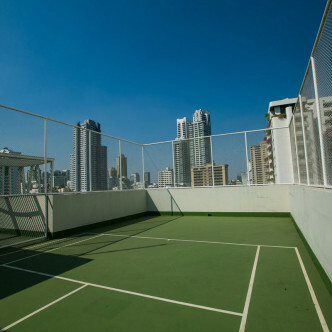 Lounging beside the large swimming pool is the perfect way to unwind on a sunny day, while the rooftop tennis court is the perfect place to play while taking in stunning city views. 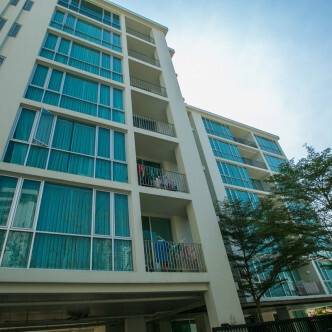 39 Residence commands a highly sought after location on Sukhumvit Soi 39. This trendy street boasts a number of excellent bars and restaurants such as L’ Opera and Le Cullinan, while the large and lovely Benjasiri Park and Emporium shopping centre can be found on the other side of Sukhumvit Road. The Phrom Pong BTS station is just a short stroll away, which makes exploring Bangkok smooth and simple. The stylish 39 Residence is your new home away from home.